Earlier this year, when the designs for South Figueroa’s My Figueroa project were released, Josef Bray-Ali wasn’t happy. While many advocates celebrated designs that would, if implemented, result in segregated bike paths, transit-only lanes, pedestrian plazas (at a minimum), Bray-Ali saw another major investment in the Downtown and area around L.A. Live. Meanwhile, the portion of Figueroa where he worked and that he loved remained a traffic sewer, with five lanes of concrete and curbside parking blighting the area. Now, with the city considering bike improvements for North Figueroa, Bray-Ali sees an opportunity to bring My Figueroa to North Figueroa. 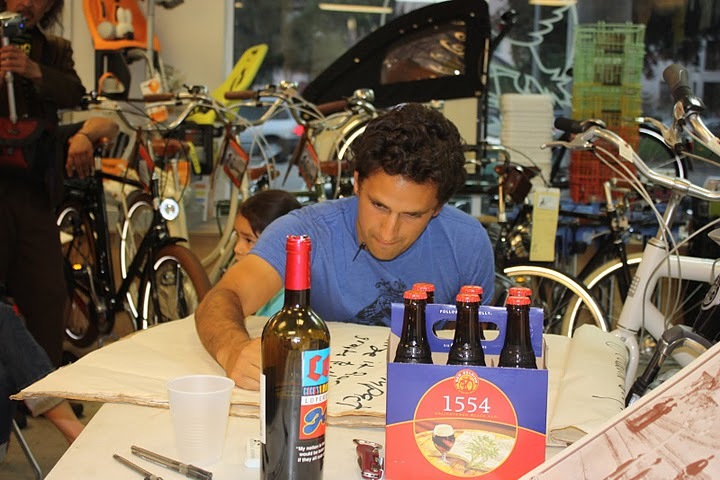 Last week, a group of thirty community activists gathered in the Flying Pigeon Bike Shop to create an organization to do just that. At the Flying Pigeon blog, Bray-Ali notes that the event expanded beyond the usual suspects with local businesses sponsoring the meeting by donating the chairs, tables, food, and other supplies. In other words, this is about more than a bike lane. Bray-Ali’s vision includes bike lanes for certain, but also a road diet, wider sidewalks, better street crossings, all of would feed into the business areas and the transit network that already exists. The Gold Line stops a few blocks from Bray-Ali’s shop, but the traffic it generates to North Figueroa businesses is scant. Patch talked to a few people who attended last week’s meeting, and found enthusiasm high. If you want more information, you can contact Josef at the Flying Pigeon Shop, or stay tuned here for details on the next meeting, which will probably be held at another North Figueroa Business, Future Studio. By then the group hopes to have a name and logo ready for prime time. The “5” should be replaced by “110”. Flying Pidgeon is near the 110 and Figueroa parallels he 110, not the 5. Look at a map.